observed. the jonberrydesign blog: foo treets! As you may have read, back before Christmas I met up with my friend Curt from Pittsburgh for a few days of decompress in a cabin in West Virginia. The first night there, we took a trip to the local Food Lion (or Foo Lion as the sign said) in Berkeley Springs to stock the kitchen. It felt a bit like time travel to me. It could just be a regional thing, and I haven't been to a supermarket here in California since then to check, but I swear I haven't seen any of these brands for years: Aim, Closeup, Schlitz? 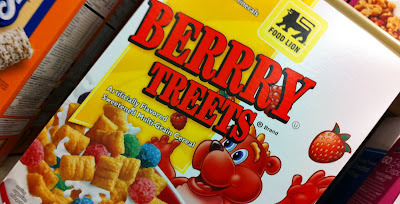 Of course that all paled compared to what I found in the cereal aisle: Berrry Treets!! That one I had never seen before, but so so many things to love about that label.